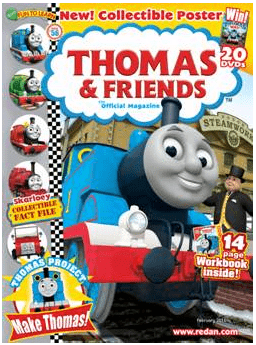 Thomas & Friends Magazine Subscription Deal – $13.99 for One Year! This is a great price on this magazine and it gets a 4 star review on Amazon too! We have heard from a number of TNWM readers that they love this subscription for their kids too, so it sounds like its mom-approved. Will they be doing a 50% again any time soon?? I want to order a subscription for my son but have not been able to find another sale like this one and am SO sad I found your blog and this deal late!!! Hi Kim – they are on sale today – https://www.thriftynorthwestmom.com/big-magazine-sale-urban-farms-thomas-friends-photography-sale/ !!! I didn’t get the notifications on your comments!!! I am so mad lol! How did I miss this again!! I am going to subscribe to here so I don’t miss it again. Thank you so much for your replies. I really do appreciate. I decided to check your site today to see if you replied and wished I had checked sooner! Please if you do know of the next time this sale is happening, I will set a reminder in my phone to keep checking to see if you comment back. Thanks again! Love your site and my subscription is all set now too! Finally caught this sale! Thank you so much for posting again :) I am excited to get this for my son! Thanks again! Hi Ed- Yes, it looks like the offer will be available again next Wed. Check back and we will have all the details for you! Thank you! My son got a Thomas catalog in the mail and loved it so much it fell apart. He will be so excited to get mail with his name on it! Just used this fantastic coupon, so excited! Thank you!